Gun salutes will be fired in London and around the United Kingdom today (21 April) to mark The Queen's 85th birthday. Gun salutes are customarily fired, both on shore and at sea, as a sign of respect or welcome. Just as a salute with the open hand was used historically to show that no weapon was concealed in the palm, so the firing of cannon as a salute indicated the friendly intent of an empty chamber. Today gun salutes mark special occasions on certain days of the year, many of them with Royal associations. On these days, Royal salutes are fired from locations in London and authorised stations in the United Kingdom. The basic Royal salute is 21 rounds. In Hyde Park an extra 20 rounds are added because it is a Royal Park. 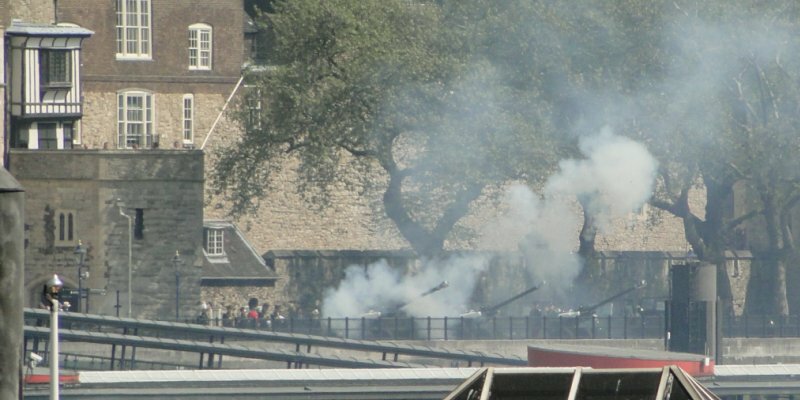 At the Tower of London 62 rounds are fired on Royal anniversaries (the basic 21, plus a further 20 because the Tower is a Royal Palace and Fortress, plus another 21 'for the City of London') and 41 on other occasions. The Tower of London probably holds the record for the most rounds fired in a single salute: 124 are fired on 10 June when The Queen's official birthday (62 rounds) coincides with The Duke of Edinburgh's birthday (also 62 rounds). Military saluting stations are London, Edinburgh Castle in Scotland, Cardiff and Hillsborough Castle in County Down, Northern Ireland. In London, salutes are fired in Hyde Park and at the Tower of London. On State Visits, at the State Opening of Parliament and for The Queen's Birthday Parade, Green Park is used instead of Hyde Park. The salute is fired by The King's Troop, Royal Horse Artillery. The first round is fired at noon (11.00 am on The Queen's official birthday). At the Tower of London, the salute is fired by the Honourable Artillery Company at 1.00 pm. • State Opening of Parliament • usually November or December).